Water authorities were also expanding the use of treated wastewater – often a polite term for sewage – for "non-potable" uses. These included flushing toilets, watering gardens, and washing cars and laundry. Today most Australian wastewater is treated then disposed into local streams, rivers, estuaries and the ocean. In Sydney, for example, the city's big three outfalls dump nearly 1 billion litres (1,000 megalitres, ML) a day into the ocean. Sydney introduced the Rouse Hill recycled water scheme in 2001. 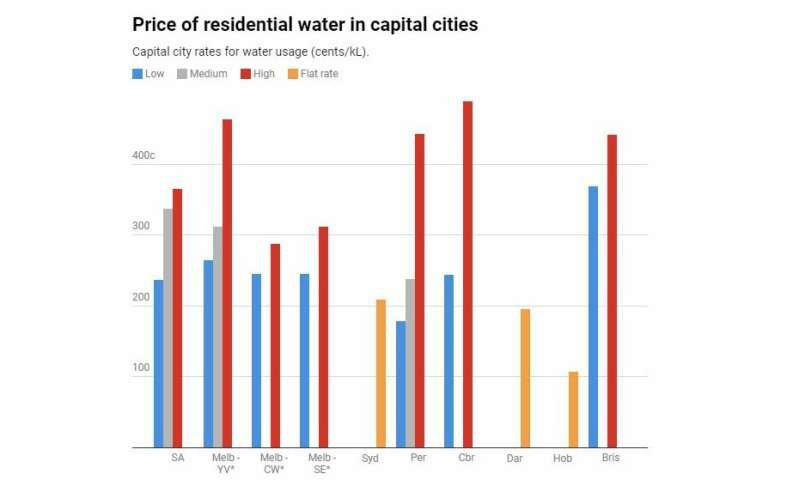 Highly treated wastewater is piped into 32,000 suburban properties in distinct purple pipes. Each property also has the normal "potable" drinking water supply. This "groundwater replenishment" adds to the groundwater that contributes about half of the city's water supply. The Water Corporation of Perth has a long-term aim to recycle 30% of its wastewater. In Sydney, water use fell steeply under water restrictions (2003-2009). 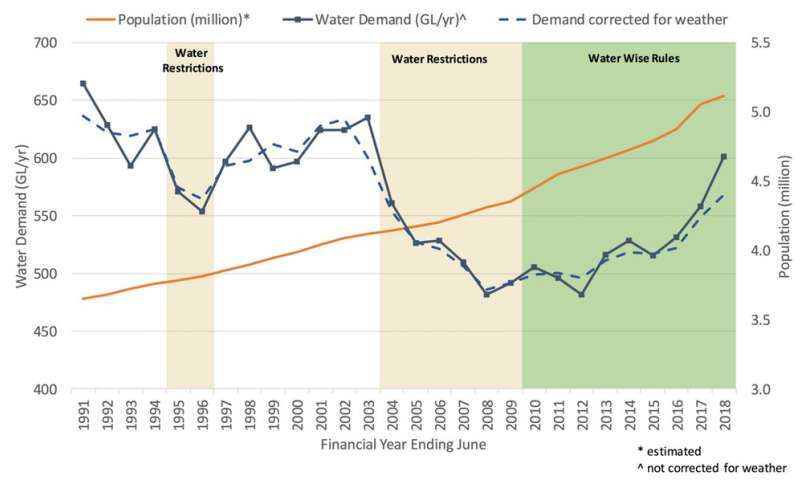 Since the restrictions have ended, consumption has increased under the softer "water wise rules". Regional centres including (Tamworth) outside of Sydney are under significant water restrictions currently with limited relief in sight. The Victorian government appears to be the Australian leader in encouraging urban water conservation. Across Melbourne water use per person averaged 161 litres a day over 2016-18. Victoria's "Target 155" program, first launched in late 2008 and revived in 2016, aims for average use of 155 litres a day. 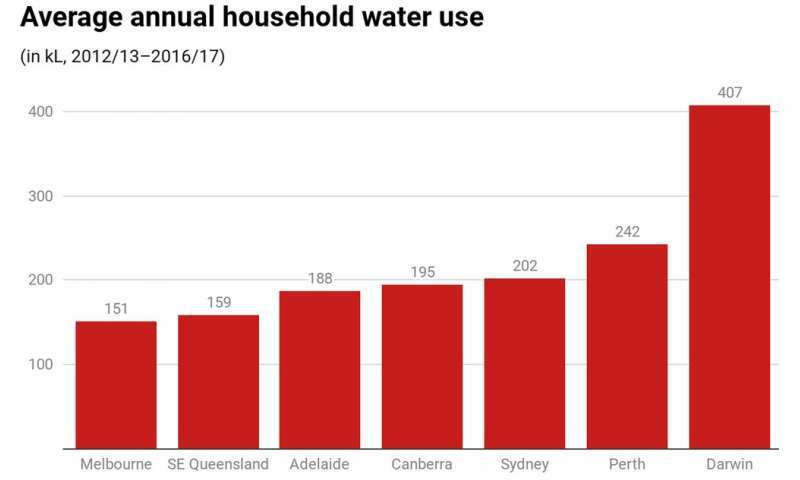 Although Melbourne water prices are among the highest of the major cities, lower annual water use meant the city's households had the lowest water bills in 2016-17, analysis by the Australian Bureau of Meteorology found. Recycling water may not be viable for Sydney Water. It can cost over $5 per 1kL to produce, but the state pricing regulator, IPART, sets the cost of recycled water to Sydney customers at just under $2 per kL. That's probably well below the cost of production.